Ryan and Carla traveled from Canada to get married at the Boardwalk Resort at Walt Disney World, Orlando, Florida. Even through rain threatened to dampen wedding day, Nicole with Disney Fairytale Weddings was able to get them in a beautiful dry location under the back porch. Disney Fire Art Photography took the weather in stride and made sure all the lighting and photography looked beautiful. 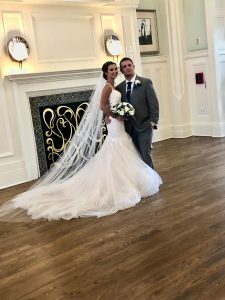 Stan Severance with STVS Video made sure to capture every moment of their wedding day on video, so the couple could share it when they returned home. I am so happy to be marrying Ryan for so many reasons, little and big; he is without a doubt my very best friend and my partner in every sense of the word. He is supportive, even when I am full of self-doubt. He is my biggest cheerleader and always encourages me to follow my passions and my dreams, even when it means that I spend $80 on new gardening supplies just to test out my often-absent “green thumb” (and it would have been so much cheaper to just keep buying kale at the supermarket). He is kind, especially to animals; he might joke and pretend to make fun that I’m the biggest sucker for an animal with a sad story, but he is just as concerned with the welfare of the furry ones as I am. He has stopped the car more than once to help me try to corral a loose dog so that we could find its owner and has suggested going out to look for a lost dog in a snowstorm because we had good snow tires and a Jeep. The way that he cares for animals makes me think of how he is going to be as a father; I just know that he is going to love, protect and spoil our kids even more than he spoils our current dog, Apollo. Ryan is definitely a great friend; he has had the same core group of friends from grade school, even though he keeps adding to his circle because he is so fun to be around. He manages to get me out of the house because he is definitely more social than I am, but we can also have the best time at home, hanging out on the couch watching movies or reruns of sitcoms with the dog. He makes me bust a gut laughing at the silliest things, sometimes until I cry from laughing so hard. He is generous and romantic; he loves to surprise me with small things like my favourite gummy candy or chocolate when I’ve had an especially good or terrible day. He shows his love in little actions every single day; more often than not, he will bring me home an Earl Grey tea on his way home from work or being out. He loves to drive me to appointments and job interviews whenever his schedule allows; for several years in a row, he drove me around to all of the schools in the St. John’s area so I could drop off my resume for subbing (note that there are approximately 30 elementary schools in the area) and we would go out to lunch together. He is almost always patient and easy-going (unless he thinks that he might be about to set the kitchen on fire, which is when it’s *his* turn to panic) and is fantastic at helping me to be more calm when I start letting small stresses spiral in my head. He makes me able to be strong when we are facing super tough times together and being with him makes the good times even better. I can’t think of anyone else that I would rather have on my team when it matters; he is the first person that I want to tell good news to and the shoulder I can always count on when I need to cry. He is my balance and helps me to be the best version of myself every day. I knew when we first started talking to each other that he was someone special and he has proven me right every single day for over 8 years. I can’t wait to spend the rest of our lives growing and learning together and I honestly feel like I am the luckiest person because he chose to love me too. Congratulations to the two of them on such a sensational ceremony.